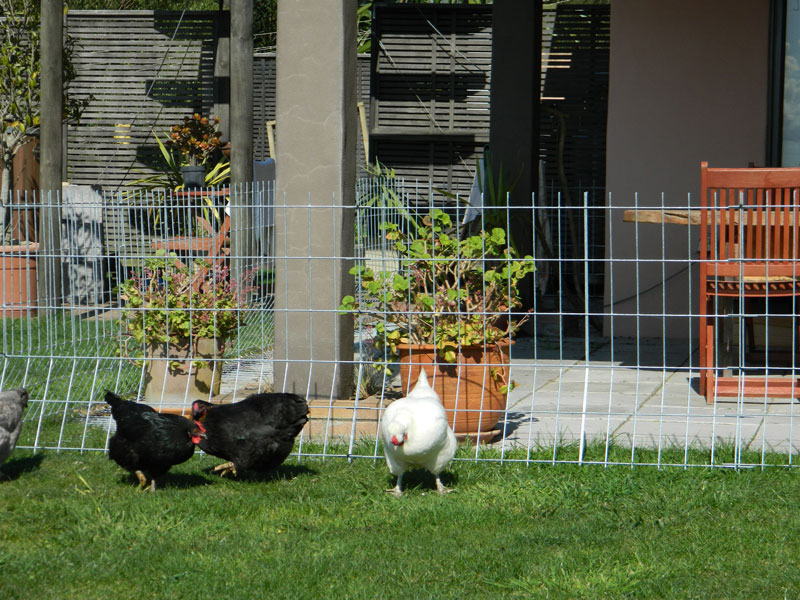 Free standing fencing to keep your chickens where you want them! Having built a house on what was formerly pasture land, trying to grow fruit vegetables and native plants just seemed to increase the insect population. 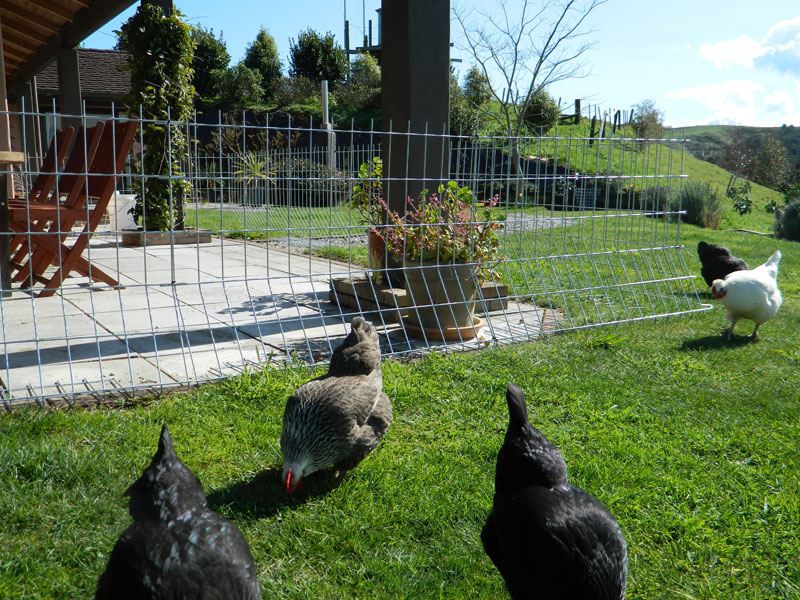 So the next decision was to have a few free-range chickens to clean up the insects. Chickens are great, but they do like company and seem to want to be wherever there are people. Cleaning up the chicken poo became the least favourite job on the property. 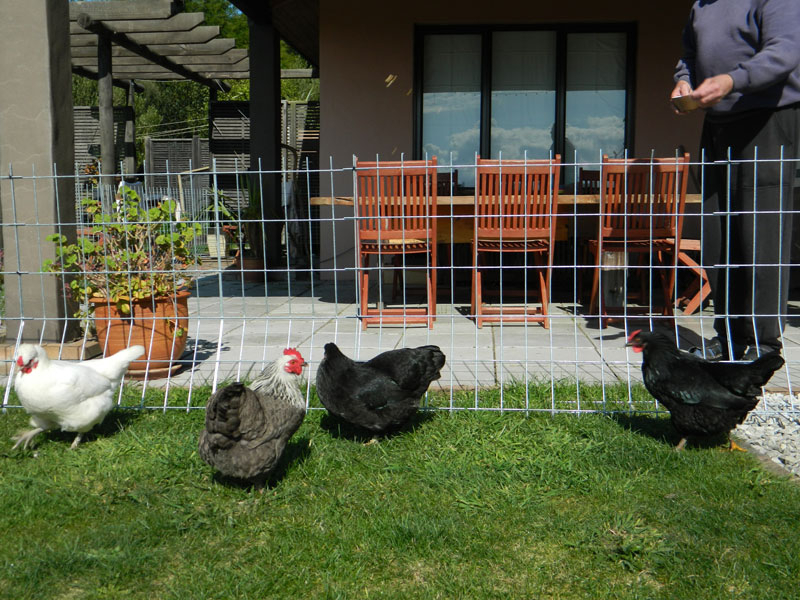 Allan decided to develop a free-standing chicken fence, to keep the chickens off the patio, which could be moved easily or removed completely when there were visitors. 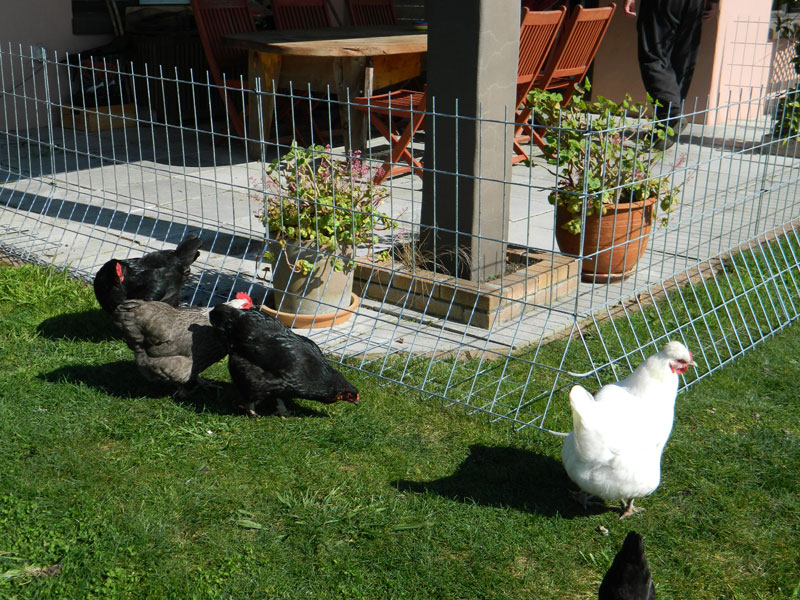 People said “What a great idea!”; “Can we have some to put around our vegetable garden to keep the chickens out?”; “Can we use it to keep our chickens in the area where we want them to stay?” This was the beginning of Chick-In-Out Fencing. 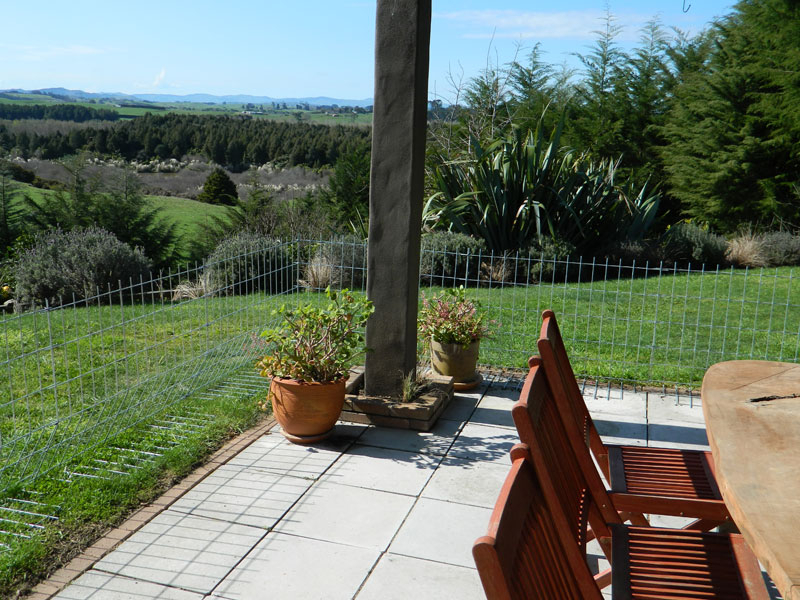 We wanted a fence that would be simple, light and free-standing. It needed to be easy to move and replace in a different location. It needed to be easy to stack for storage. It needed to be durable and versatile, so that different shaped areas could be fenced. Gates would be needed too. 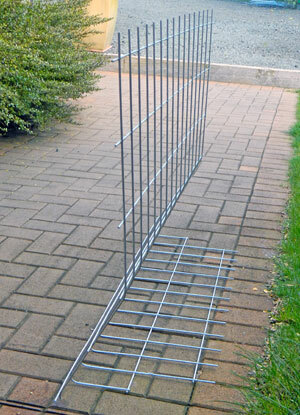 The fencing is made from hot-dip galvanised robust 4mm wire mesh with openings 75mm x 150mm. The standard panels are 1.2m long and 850mm high. 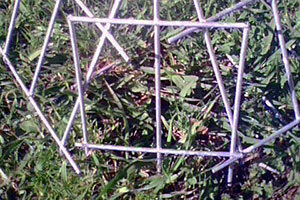 The wire mesh is specially bent so that it will stand, on its own, without any additional support, even in wind. Each order will include, in the total price, a packet of plastic cable ties and corner pieces if required. The panels are can be easily joined together using plastic cable ties, to make any shape or size required. 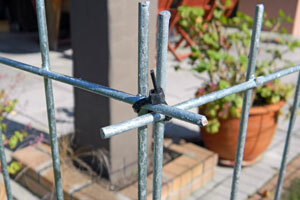 The corners can be sealed using these triangular sections of fencing held in place with cable ties. 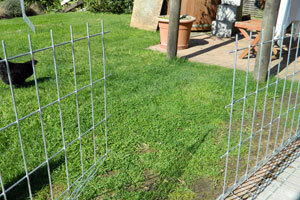 Gates can be made using the plastic cable ties as hinges. We believe that the line of spikes on top of the fence is what chickens do not like and they will not even try to sit on it. A number of people have asked whether it is really high enough to stop chickens flying over it!! Chickens are actually not very good flyers – they need a bit of space to take off and land. Our experience is that, in a limited area, they will not fly over this fence because they simply do not like the spiky top and are not prepared to try and perch on it. If you give them something else to perch on, or there is a bit of higher ground nearby, then yes, they will be able to get over it. We have flighty Araucana-cross hens with unclipped wings. 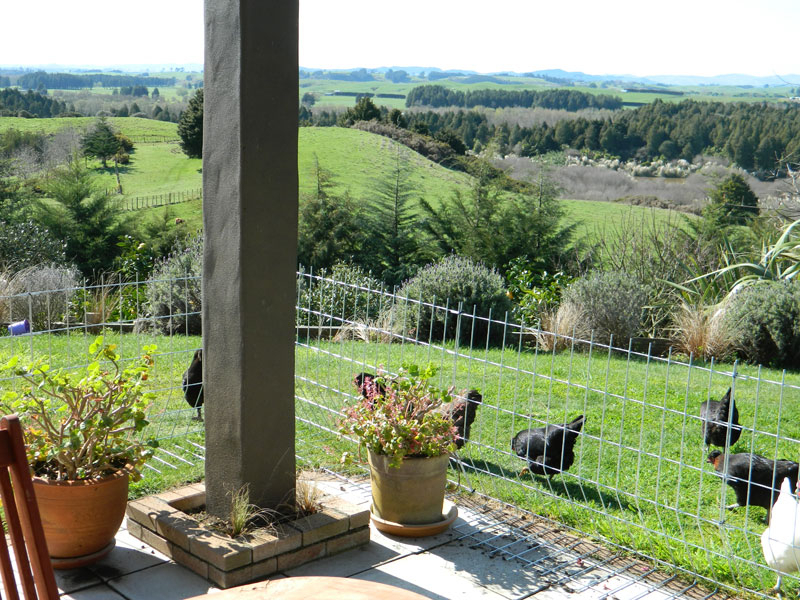 We took our patio fence down for our family Xmas and put it back in place again after 3 weeks to control the 6 hens and 4 tiny Xmas day chicks. Eight weeks on and these chicks are roosting on top of the pergola (2m high) and the hens are on top of the trellis but none of them have entered the patio area. Copyright © 2019 Allan's Lifestyle Products. All Rights Reserved.